This blog’s topic will be explored in the next two or three entries. 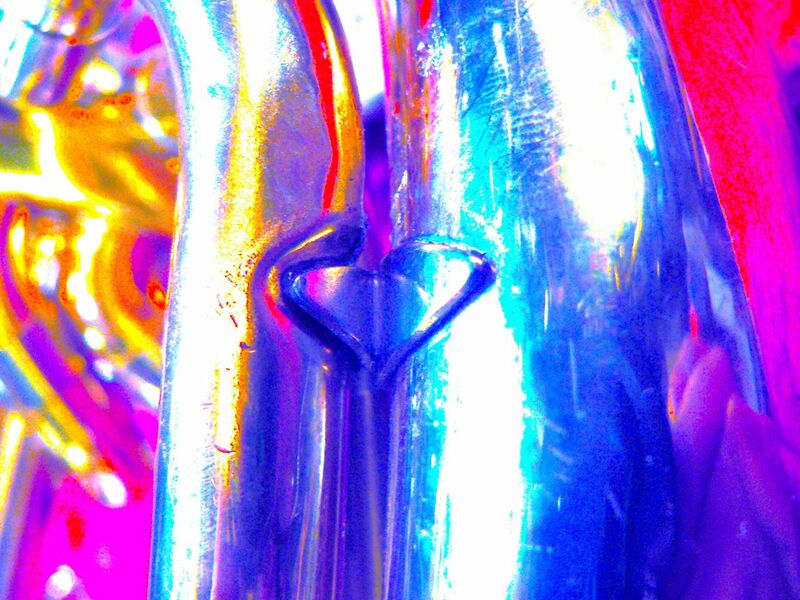 The techniques and discussion here-in are not endorsed by any school of instrument repair and are suspect due to the author’s questionable state of mind. 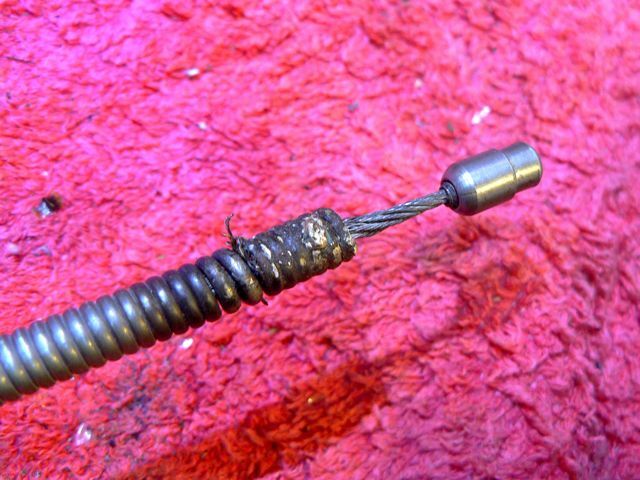 It seems that every year I use up and break at least one Ferree’s stroke cable. 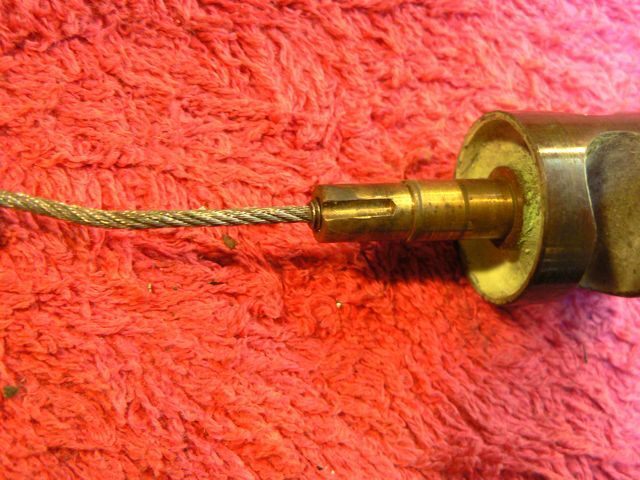 In this blog I’ll make a tool utilizing the remnants of a small stroke cable. I’ve used a larger version for several years. 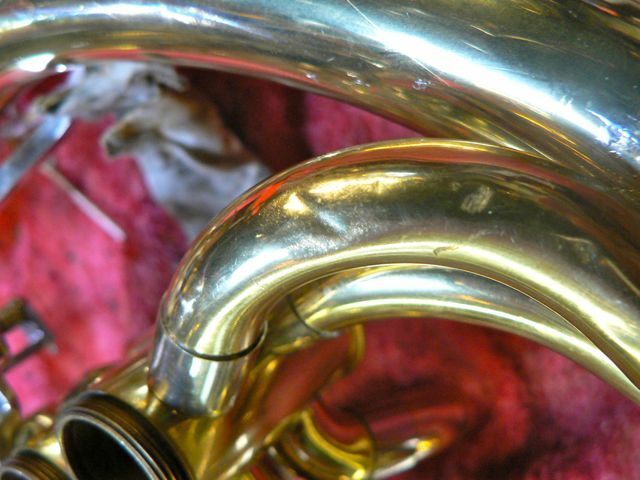 The dent shown above is probably not worth fussing with, A horn is for a young teen player, these dents are in the first branch, which is the tapered branch that comes out of the change valve of this Geyer wrap and connects with the bell branch. Because the terminus is a valve that has no easy access there is only one direction to approach it from…Up the bell throat and into the first branch stopping shy of the change valve’s ports Beyond the brace dent in the color altered pix are a couple of minor dents that it would be nice to remove. 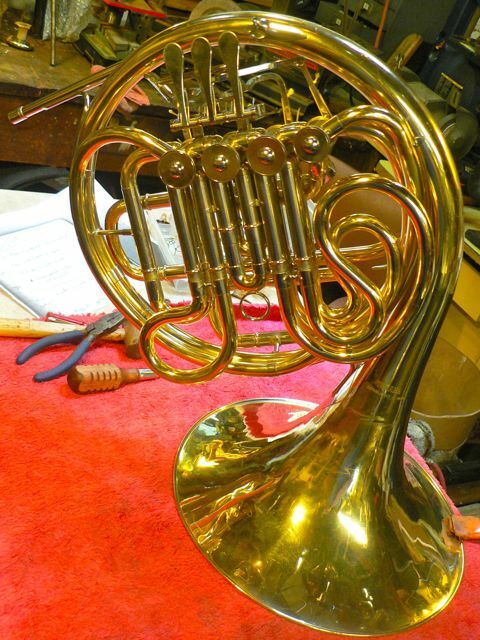 The horn is a Yamaha 567. The bell was rolled out earlier in the horns life, but no attempt was made to remove the few dents within the wrap. So a trip to the local hardware store is in order to fetch a part of the high tech tool. You’ll note that this auger is only 1/4″ in diameter. The earlier one I built used a 3/8″ auger. 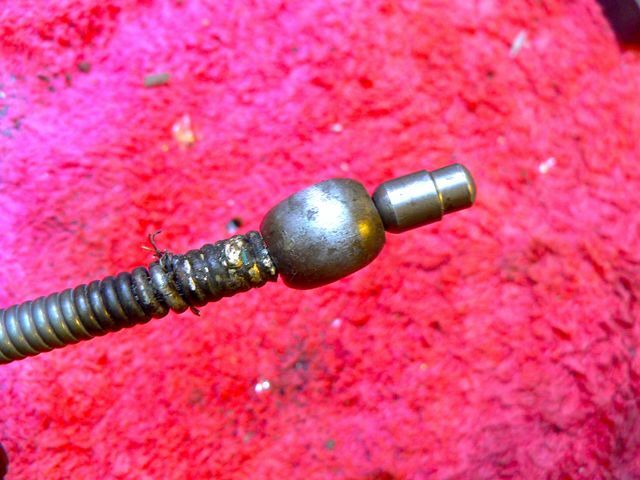 ( it uses a re purposed broken Ferree’s large stroke cable.) Well, they lied, it’s not .25″ in diameter but in face .2624″ in diameter, but it will have to do, After all I spent about $7.00 for it… Here’s where they break, where the twisted wire leaves the female end of the stroke cable. 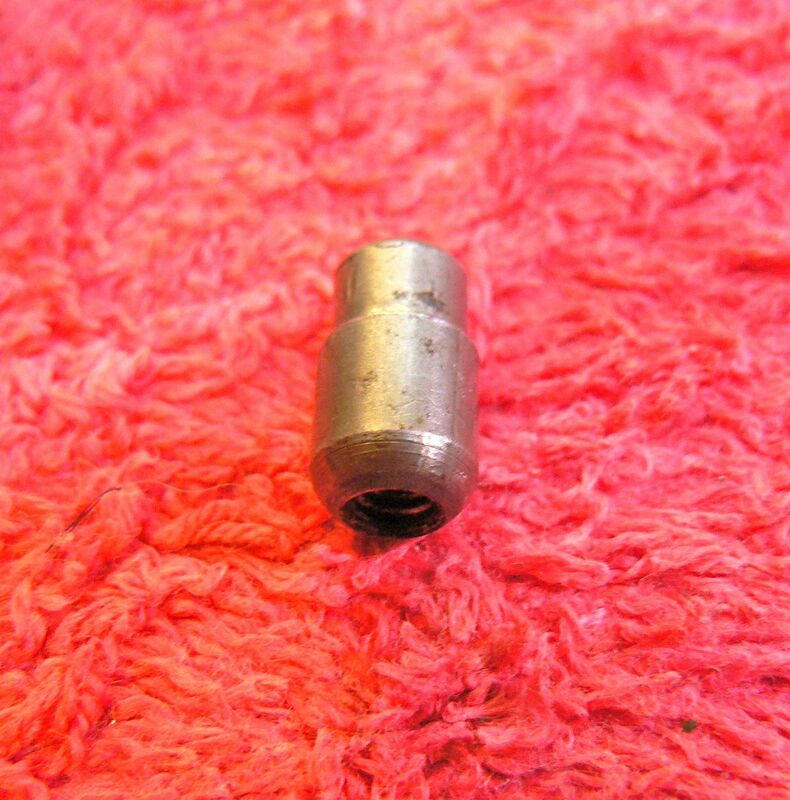 Once it has broken off it can be used as the stop nut at the male end of the factory or modified cable. The female end, at the top of this piece would be where the cable came out, now broken off. 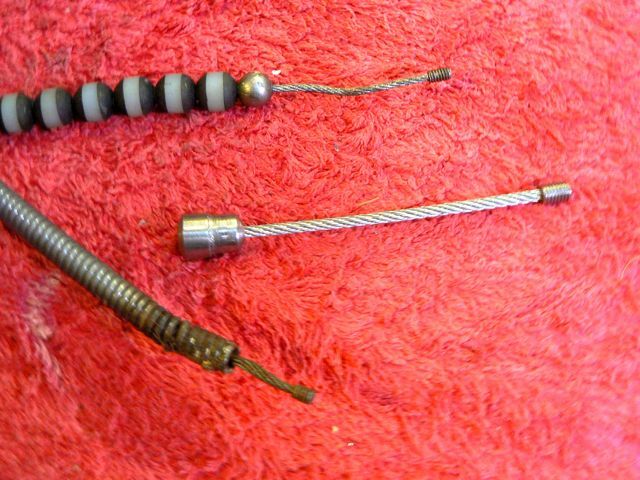 Stroke cables create a mini hammer within an instruments tube. 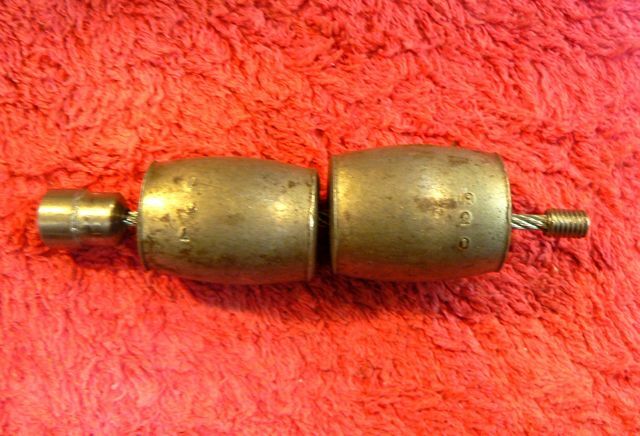 Using a set of dent balls from Feerre’s, Votaw or similar, they work back and forth with a stroke of the hand to slowly and gently raise dents. 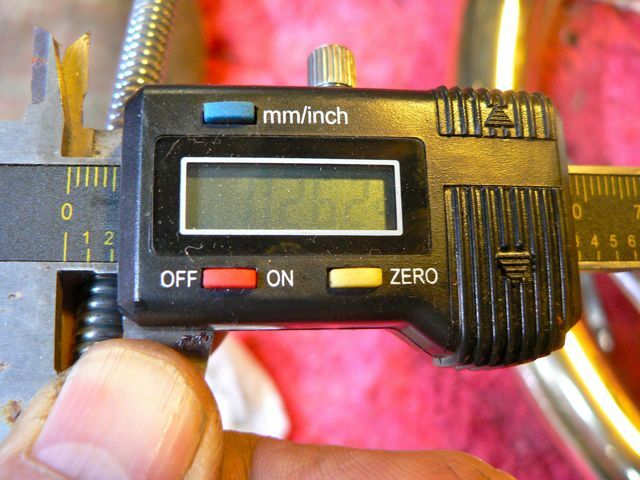 You begin with the smallest ball that will not pass the dent and work up dent ball by dent ball (generally .005″ increments) until you have reached, as closely as possible to the internal deminsion of the tube prior to denting. The rear ball is the driver and it is pushing a ball that has a larger size. Shown is the larger of the two stroke cables that Ferree’s makes. On the right side there would be a screw on stop. You can see that the travel on the stroke cable is about 3/8″. It varies with the size of the dent balls. 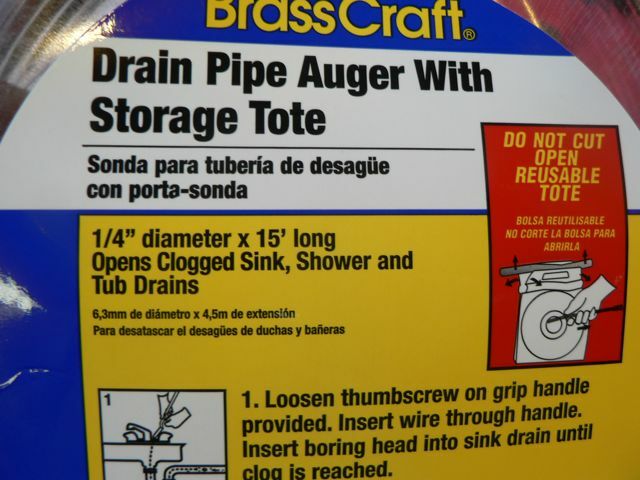 Here is the 1/4″ auger with the little swollen end that helps to open your sink drain cut off. Inside it is a re-purposed broken small stroke cable. You’re seeing the cable with the stop nut, which screws on and off in place. I bent the cable back on itself to fill the hole within the wrap of the auger and silver soldered it into place. (you can see some of the little wires, rogues that they are, trying to escape out of the auger) This is much stronger than a lead based solder. Silver solder is actually worked at a brazing temperatures. I intentionally kept the exposure of the Ferree’s cable at about the length of dent balls that are within the inner wraps diameters, say, .470 and down. This keeps me from trying to use larger dent balls than should be used on the little 1/4″ auger. 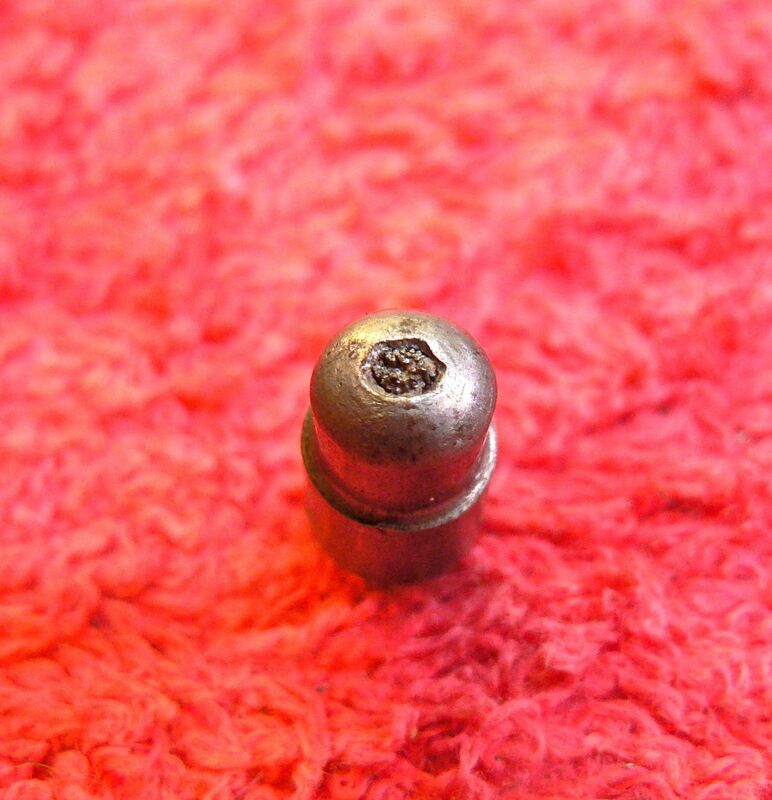 OBTW, If you were to misplace or loose the stop screw, it uses the same thread as a King single horn valve, Of which I have several from broken horns that have re-purposed parts to other King horns.